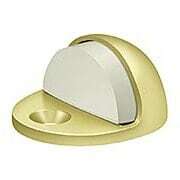 Add a decorative door stop to prevent your doors from opening into cabinets and furniture. 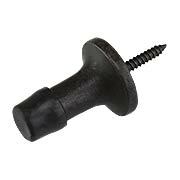 We have door stoppers that mount on the wall, floor or on the hinge pin. Classic designs and a variety of finishes mean you'll find a door stop that protects and looks good. This stepped base stop is so good looking, you'll hate to mount it behind your door! The clean-lined modern design is crafted from solid, cast brass, and finished with a grey rubber bumper. 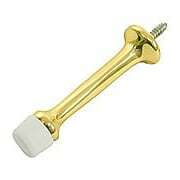 At 3 3/4" long, it's perfect for bathroom doors with towel bars! 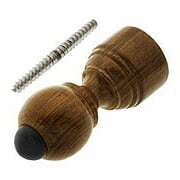 Hardwood door stops, like this Wood Floor-Mount, were popular in the Victorian era. 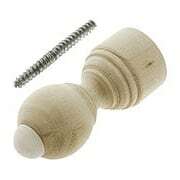 Turned from solid wood, our shapely reproduction is easily installed with the included lag screw. Available in your choice of pine (lacquered or unlacquered) or stained and lacquered rosewood. 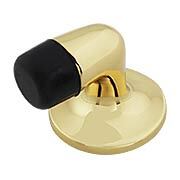 Our 3 3/4-Inch Wall-Mount Door Stop is perfect for the design-conscious modernists! Combining a smooth round base with a perfectly tapered stem, this streamline accent is ideal for Mid-Century interiors. Crafted from solid brass. 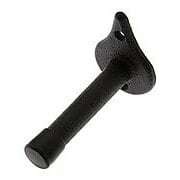 Use the Gooseneck Floor-Mount Door Stop wherever a wall mounted stop won't do. 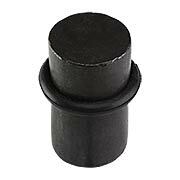 Installed on the floor close to the jamb, it prevents the door from banging into walls, cabinets or furniture. Crafted from solid brass. 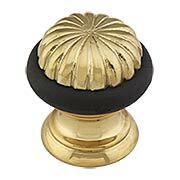 Understated, yet elegant our Reeded Floor-Mount Door Stop brings Classical flair to your decor. 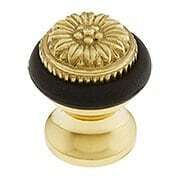 Constructed of solid brass this traditional style features a reeded design and leafy motif. A perfect choice for any formal setting, it comes in an array of rich finishes. What a dignified addition to your decor! 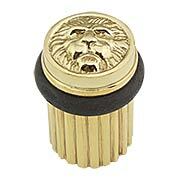 Our Lion Head Floor-Mount Door Stop dates from the Victorian era but is Neo-Classical in spirit. This regal design is reproduced in solid brass and comes in an array of popular finishes. 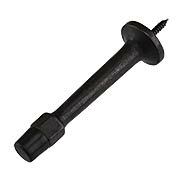 Solid cast iron Colonial style doorstop with spear base. 3 1/8" projection with a black rubber bumper. 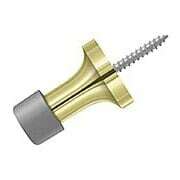 Surface mounted to the baseboard or door with wood screws. 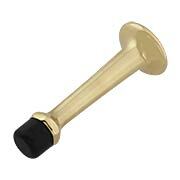 Our 3 1/2-Inch Traditional-Style Baseboard Door Stop with Rubber Bumper brings an elegant look to your decor. 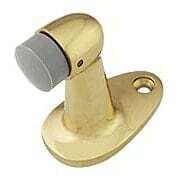 Made of solid brass, it comes in an array of popular finishes. 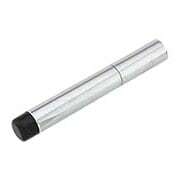 Our 1 1/2-Inch Baseboard Door Stop with Bumper brings contemporary style to your decor. 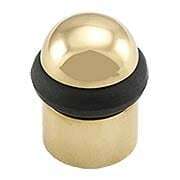 Made of solid brass, it features a sleek, straight design and comes in an array of popular finish. Our Gooseneck Door Stop goes wherever a wall-mount stop won't do. 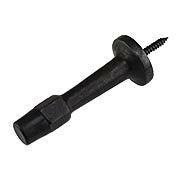 Installed on the floor close to the jamb, it prevents the door from banging into walls, cabinets, or furniture (installed too far out from the wall, it can be a tripping hazard). 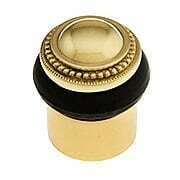 Made of solid brass, it comes in an array of fine finishes. 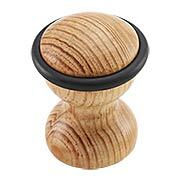 Our smooth and simple door stop is a popular addition to any décor. 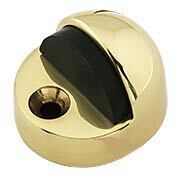 Made of solid brass, with a durable black bumper and an array of classic finishes. 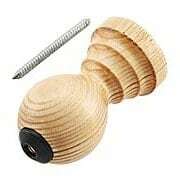 To install, simply unscrew the top cap, insert the wood screw through the hollow shaft and drive screw into the floor (pre-drill hole). 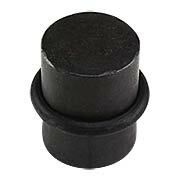 With a smooth, simple design, our Post Floor-Mount Doorstop is a fitting addition to any decor. 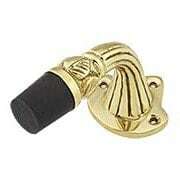 Made of solid brass it features a durable black bumper and is offered in an array of popular finish options. Comes complete with concealed mounting hardware. 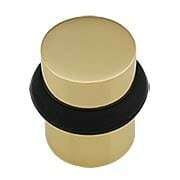 The Tall Dome Door Stop is suitable for residential or commercial use. 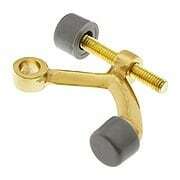 Made of solid brass with black rubber bumper, it is a sturdy alternative to baseboard mounted models. Minimum 1/2-inch clearance required. 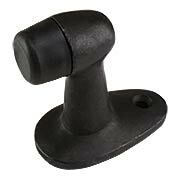 Solid-Bronze Baseboard Door Stop - 1 1/2"
With a rustic, yet refined presence, our Solid-Bronze Baseboard Door Stop suits a variety of interiors. The hand-applied finish ages gracefully, with frequently touched areas exposing the natural shades of the bronze, while other areas oxidize further. The result? An elegant and timeless display of contrasting color variations. Handcrafted from the finest-quality materials, each piece has its own, unique character. 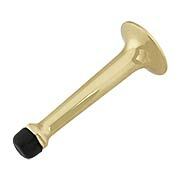 Solid-Bronze Baseboard Door Stop - 3"
With a rustic, yet refined presence, our Solid Bronze Baseboard Door Stop (3-Inch Height) suits a variety of home styles. The hand-applied finish ages gracefully, with frequently touched areas exposing the natural shades of the bronze, while other areas oxidize further. The result? An elegant and timeless display of contrasting color variations. Handcrafted from the finest-quality materials, each piece has its own, unique character. Includes rubber bumper. 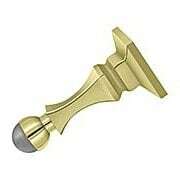 Solid-Bronze Baseboard Door Stop - 4"
With a rustic, yet refined presence, our Solid Bronze Baseboard Door Stop (4-Inch Height) suits a variety of home styles. The hand-applied finish ages gracefully, with frequently touched areas exposing the natural shades of the bronze, while other areas oxidize further. The result? An elegant and timeless display of contrasting color variations. Handcrafted from the finest-quality materials, each piece has its own, unique character. Includes rubber bumper. With a rustic, yet refined presence, our Solid Bronze Floor-Mount Cylindrical Door Stop suits a variety of home styles. The hand-applied finish ages gracefully, with frequently touched areas exposing the natural shades of the bronze, while other areas oxidize further. The result? An elegant and timeless display of contrasting color variations. Handcrafted from the finest-quality materials, each piece has its own, unique character. With a rustic, yet refined presence, our Solid Bronze Door Goose-Neck Door Stop suits a variety of home styles. The hand-applied finish ages gracefully, with frequently touched areas exposing the natural shades of the bronze, while other areas oxidize further. The result? An elegant and timeless display of contrasting color variations. Handcrafted from the finest-quality materials, each piece has its own, unique character. Includes rubber bumper.